Tricks to classical tunes • Richard Hatch and family bring "Matinée Enchantée" to Logan. Leah Hogsten | The Salt Lake Tribune Richard Hatch entertains the audience during the "Matinée Enchantée" show Saturday April 9, 2011. Richard Hatch is a professionally trained "deceptionist," i.e., magician, who also holds two graduate degrees in physics from Yale University. 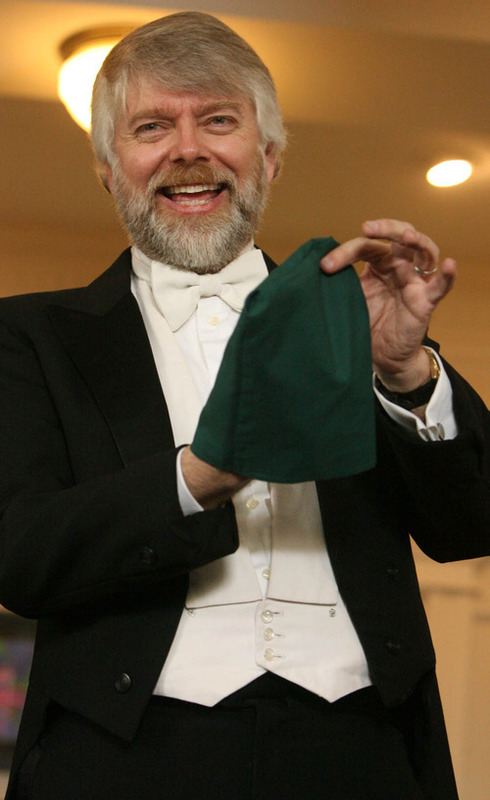 He's brought back the French tradition of magic shows with "Matinée Enchantée" accompanied by classical music played by his son Jonathan on piano and his wife Rosemary on the violin. Leah Hogsten | The Salt Lake Tribune Richard Hatch entertains Charlie Viator and Hailey Burns (right) during the "Matinée Enchantée" show Saturday April 9, 2011. Richard Hatch is a professionally trained "deceptionist," i.e., magician, who also holds two graduate degrees in physics from Yale University. He's brought back the French tradition of magic shows with "Matinée Enchantée" accompanied by classical music played by his son Jonathan on piano and his wife Rosemary on the violin. Leah Hogsten | The Salt Lake Tribune Richard Hatch entertains the audience during the "Matinée Enchantée" show Saturday April 9, 2011. Richard Hatch is a professionally trained "deceptionist," i.e., magician, who also holds two graduate degrees in physics from Yale University. 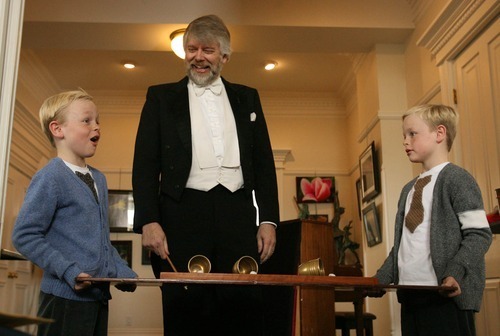 He's brought back the French tradition of magic shows with "Matinée Enchantée" accompanied by classical music played by his son Jonathan on piano and his wife Rosemary on the violin. Leah Hogsten | The Salt Lake Tribune Richard Hatch entertains twin brothers Rome (left) and Gage Peterson during the "Matinée Enchantée" show Saturday April 9, 2011. Richard Hatch is a professionally trained "deceptionist," i.e., magician, who also holds two graduate degrees in physics from Yale University. He's brought back the French tradition of magic shows with "Matinée Enchantée" accompanied by classical music played by his son Jonathan on piano and his wife Rosemary on the violin. 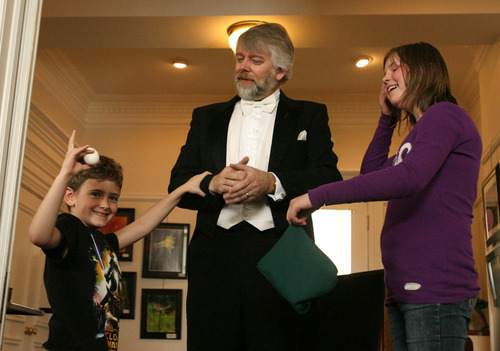 "Magic teaches a lot about how the minds works," Richard Hatch said when he first launched his series of magic tricks accompanied to classical music in Logan earlier this year. "It explores gaps in people's logic and thinking. The best audience in the world is a room full of doctorates and people with advanced educations. It's often children who are hardest to impress because they don't have the same patterns of accepted understanding. I love not knowing; I hate the word 'fooled.' "
Hence Hatch's preference for the term "deceptionist," as opposed to magician. It's a more honest label for what magicians do. Performances combining magic with classical music were pioneered by renowned 19th-century French magician Jean Eugène Robert-Houdin, who called them "Soirées Fantastiques." The Hatch family tradition dubbed them "Matinées Enchantées," in homage to Robert-Houdin, but with a slight name change to mark the afternoon performance time. When • Nov. 19, 2 p.m.
Info » $7-$10. Call 435-932-0017 or visit http://www.HatchAcademy.com.